Ingolstadt/Los Angeles, November 29, 2018 – Audi is presenting one of the stars of the 2018 Auto Show in Los Angeles, with the electric powered Audi e-tron GT concept a four-door coupé is making its debut as a show car. The volume-production counterpart is set to follow in around two years. The next electric Audi is being launched, following in the footsteps of the Audi e-tron SUV and the Audi e-tron Sportback slated for 2019. This time with a flat-floor architecture that provides for exciting proportions and a low centre of gravity. Its 434kW ensure performance fit for a sports car, with torque transferred to the wheels via the quattro permanent all-wheel drive with torque vectoring. The performance subsidiary Audi Sport GmbH is responsible for subsequently transforming the car into a volume-production model. 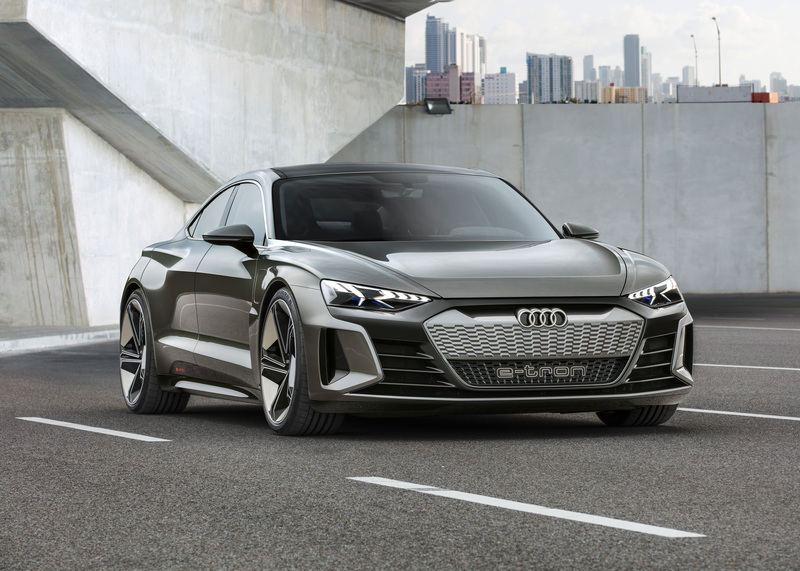 Flat, wide and with a long wheelbase – those are the proportions of a classic Gran Turismo and the Audi e-tron GT concept reflects these with its 4.96-metre length, 1.96-metere width and 1.38-metre height. The lightweight body of the four-door coupé is manufactured using a multi-material construction with a roof section made from carbon along with numerous aluminium components and supporting elements made from high-strength steel. The technology for this vehicle was developed in close collaboration with Porsche. Design and character are packed full of unmistakable Audi DNA. The gently sloping roofline of the e-tron GT concept that extends well into the rear echoes the Sportback layout that is the hallmark of the brand. This is however clearly taken forward into the future, pointing the way to the next evolutionary stage of the Audi design language. The cabin that tapers strongly toward the rear stands out compared with current Audi models. Wheel arches and shoulders are sculpted emphatically and, together with the flat floor that is unusual for an electric vehicle, visually underlines the low centre of gravity and the dynamic potential of the Audi e-tron GT concept. The broad lines and the numerous functional elements of the body as well as the air vents of the wheel arches and the solid rear diffuser emphasise its origins in the wind tunnel. A low drag coefficient that reduces fuel consumption and the low uplift visually characterise the design. The sill area between the wheel arches has been drawn way outwards, creating a distinctive contrast with the cabin. The sill draws the eye to the underfloor area where the battery and the energy centre of the Audi e-tron GT concept are located. The design of the wheels with their five twin spokes is also visibly aligned to their function. Their dynamic design provides optimum ventilation of the brake disks while also reducing drag. Shod with 285/30 size tyres, the 22-inch wheels also make a clear statement when seen from the side. The hallmark Audi Singleframe is located in the centre of the front section and compared with the two e-tron SUVs its architecture is much more horizontal. The top half comes with a cover painted in body colour and its surface structure is reminiscent of the typical honeycomb pattern of the grille on the Audi RS models – a visual signal which characterises the Audi e-tron GT concept as a future product of Audi Sport GmbH. Together with the targeted airflow of the body, large air inlets in the front effectively cool the assemblies, battery and brakes. The bonnet with its airflow on the surface echoes the brand's two latest show cars, the Aicon and the PB18 e-tron. It is designed in such a way that the airflow hugs the body, thus reducing undesired swirl. The arrow-shaped front section also emphasises the matrix LED headlights with laser high beam, underscoring the dynamic presence of the Audi e-tron GT concept even while stationary. As already seen with the brand's current Visions vehicles, the light is also animated here and welcomes the driver with a short function sequence, the wave of light that extends horizontally: a new visual signature that is set to find its way into volume production in future. A light strip runs across the entire width of the rear, the strip dissipating at the outer edges, in the actual lighting units, into individual wedge-shaped LED segments. This architecture links the e-tron GT with the volume-production SUV e-tron, making both instantly recognisable as Audi electric vehicles even in the dark. The new exterior colour kinetic dust – a warm, dark colour akin to titanium – comes across as practical without being 'technoid' standoffish. Depending on the incidence and movement of the light, it provides significant contrast between the body surfaces. Matt, warm-tinted aluminium elements on the window slot trim and rims emphasise these effects even further. Four doors, four seats with 2.90 metre wheelbase – in the interior the Audi e-tron GT concept provides a large dose of everyday usability, coupled with a superb quality feel. The functional centre of the interior is located at the front left, visibly focused on the driver's seat. The centre console, the large touchscreen in the top section and the line from the door rail and cockpit frame the driver's workplace, perfectly incorporate the driver ergonomically with the controls and the infotainment of the Audi e-tron GT. The centre console and the freestanding instrument cluster seem to float. Light colours in the top section of the cockpit and the darker gradation through to the floor area create the impression of clear width. Sport seats inspired by motor racing in both rows of seats provide optimum lateral support even while cornering at speed. Both the screen of the central instrument and the touchscreen above the centre console come with a black-panel look finish. They underscore the large, calm design of the interior with its predominantly horizontal basic architecture. Various layouts are available for the monitors to present the functions depending on the driver's preference, including virtual instrument dials, easy-to-read navigation maps with information on the range, or various infotainment function menus. They are controlled via the touchscreen with tactile feedback. With the concept car the designers have deliberately gone for the consistent use of sustainable materials – a clear statement of contemporary automotive design. Animal-based products are not used at all: the Audi e-tron GT concept comes with a vegan interior. Sophisticated, synthetic leather is used on the seats and other trim surfaces. Fabrics made from recycled fibers are used on the seat cushions as well as the armrests and on the centre console. Microfiber material adorns the headlining and the trim of the window pillars and even the deep-pile floor carpet is made from sustainable Econyl yarn, a recycled fiber made from used fishing nets. With two luggage compartments, the Audi e-tron GT concept offers a great many options for a Gran Turismo. It makes full use of its concept advantage as an electric vehicle with compact drive units. The rear with its large tailgate offers up to 450 litres of luggage capacity, while under the bonnet there is an extra 100 litres of capacity. The all-electric drive produces 434 kilowatts of system power with separate electric motors fitted to the front and rear axles. In both cases these are permanently excited synchronous motors. They put down the torque onto the road via all four driven wheels – naturally the new Audi e-tron GT concept is also a genuine quattro. An electric quattro to be precise, since there is no mechanical link between the front and rear axle. The electronic control system co-ordinates the drive between the axles as well as between left and right wheels, meaning optimum traction and just the desired amount of slip. In future, the vehicle should accelerate from 0 to 100km/h in around 3.5 seconds before going on to 200km/h in just over 12 seconds. The top speed is regulated at 240km/h to maximise the range. One feature that not all the competition can match is the option of fully utilising the drive's acceleration potential several times in succession. While elsewhere the drive is switched to overdrive for thermal considerations, the Audi e-tron GT concept can provide the driver with the full potential of both motors and the battery thanks to its sophisticated cooling strategy. The range of the concept car will be over 400 kilometres determined according to the new WLTP standard. The required drive energy comes from a lithium-ion battery with an energy content of more than 90kWh, which takes up the entire underfloor area between the front and rear axle with its flat design. The decisive advantage of this design is the car's extremely low centre of gravity – comparable with that of the Audi R8 – which in turn decisively benefits dynamic handling. All-wheel steering translates this into a perfect synthesis of sports car-like agility and precision, augmented by superb directional stability. The recuperation system increases the range by up to 30 percent on Audi electric vehicles – this is essential even with such a sporty car as the Audi e-tron GT concept. The recuperation involves both the two electric motors and the electrohydraulically integrated brake control system. Different recuperation modes are combined: manual coasting recuperation using the shift paddles, automatic coasting recuperation via the predictive efficiency assist, and brake recuperation with smooth transition between electric and hydraulic deceleration. Up to 0.3 g, the Audi e-tron GT concept recuperates energy solely via the electric motors, without using the conventional brake – that covers over 90 percent of all decelerations. As a result, energy is fed back to the battery in practically all normal braking manoeuvres. The wheel brakes are involved only when the driver decelerates by more than 0.3 g using the brake pedal. The Audi e-tron GT concept features high-performance ceramic disks which also operate with multiple extreme decelerations without compromising braking performance. The battery in the Audi e-tron GT concept can be charged in several ways: using a cable which is connected behind the flap in the left front wing, or by means of contactless induction with Audi Wireless Charging. Here a charging pad with integral coil is installed permanently on the floor where the car is to be parked, and connected to the power supply. The alternating magnetic field induces an alternating voltage in the secondary coil fitted in the floor of the car, across the air gap. With a charging output of 11kW the Audi e-tron GT concept can be fully charged conveniently overnight. Wired charging is much faster as the four-door coupé is fitted with an 800-volt system. This substantially reduces charging times compared with conventional systems that are currently in use. Thus it takes around 20 minutes to recharge the battery to 80 percent of its capacity, once again providing a range of more than 320 kilometres (WLTP). The e-tron GT concept can, however, also be recharged at charging points with lower voltages, providing the driver with access to the entire charging network. Audi launched its electric offensive with the world premiere of the all-electric SUV Audi e-tron in September 2018. By 2025 Audi will offer 12 vehicles with all-electric drive in the most important markets worldwide and achieve roughly one-third of its sales with electrified models. The SUVs within this portfolio include the Audi e-tron and the Audi e-tron Sportback due to make its debut in 2019. In addition, there will be a range of models with classic body layout such as Avant and Sportback. The range will cover every relevant market segment from the compact to the full-size class. The technology in the Audi e-tron GT concept show car was developed in collaboration with Porsche. The project will be developed into volume-production models by the end of 2020 with initial deliveries will be made to customers in early 2021. Another joint project of the development departments at Audi and Porsche is the Premium Platform Electric (PPE). It will be the foundation for multiple Audi model families with all-electric drive covering the high-volume B through D segments. The Audi e-tron GT concept is unveiled at Los Angeles Auto Show.